First surface combatants deploy using alternative fuel made from waste beef tallow. Secretary of the Navy Ray Mabus and Agriculture Secretary Tom Vilsack kicked off the Great Green Fleet with the deployment of the USS John C. Stennis Carrier Strike Group (JCS CSG) during a ceremony at Naval Air Station North Island on Wednesday. Secretary of the Navy (SECNAV) Ray Mabus shows Agriculture Secretary Tom Vilsack a fuel sample of alternative fuel aboard the guided-missile destroyer USS William P. Lawrence (DDG 110) on Wednesday, Jan. 20, 2016. 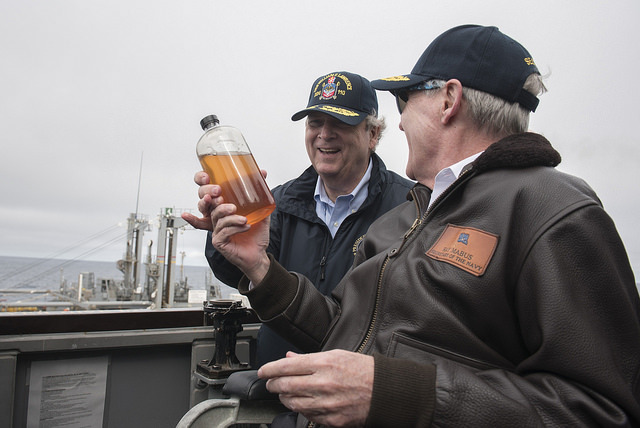 Secretary Mabus and Secretary Vilsack flew out to William P. Lawrence to witness it replenishing its tanks with the fuel, made from waste beef fat, from the fleet replenishment oiler USNS Guadalupe (T-AO 200) as part of the Department of the Navy’s Great Green Fleet initiative. Navy photo by Mass Communication Specialist 2nd Class Armando Gonzales/Released. "When it comes to power, my focus has been about one thing and one thing only: better war-fighting," Mabus said. "The Great Green Fleet shows how we are transforming our energy use to make us better war-fighters, to go farther, stay longer and deliver more firepower. In short, to enable us to provide the global presence — that is our mission." The blend fueling the JCS CSG's surface ships contains alternative fuel made from waste beef fat provided by farmers in the Midwest. It was purchased at a cost-competitive price through a partnership between the Department of the Navy and the U.S. Department of Agriculture aimed at making alternative fuel blends a regular part of the military's bulk operational fuel supply. With the USS John C. Stennis (CVN 74) and Stockdale in the background, Mabus and Vilsack explained why this milestone alternative fuel purchase is important to the Navy and Marine Corps and how it supports America's farmers, ranchers and rural manufacturing jobs. "The Navy's use of renewable energy in the Great Green Fleet represents its ability to diversify its energy sources, and also our nation's ability to take what would be a waste product and create homegrown, clean, advanced biofuels to support a variety of transportation needs," Vilsack said. "Today's deployment proves that America is on its way to a secure, clean energy future, where both defense and commercial transportation can be fueled by our own hardworking farmers and ranchers, reduce landfill waste and bring manufacturing jobs back to rural America." JCS CSG, the centerpiece of the Great Green Fleet, deployed using energy conservation measures (ECMs), including stern flaps, LED lights and energy-efficient operational procedures, and alternative fuel in the course of its normal operations. Other ships, aircraft, amphibious and expeditionary forces and shore installations using ECMs and/or alternative fuels in the course of performing planned mission functions will be part of the Great Green Fleet throughout 2016. Stockdale is the first surface combatant to receive alternative fuel as part of its regular operational supply. Following the ceremony, Mabus and Vilsack flew out to the destroyer USS William P. Lawrence (DDG 110) to witness it replenishing its tanks with alternative fuel from fleet replenishment oiler USNS Guadalupe (T-AO 200). The remainder of the CSG surface ships will receive fuel from fast combat support ship USNS Rainier (T-AOE 7), which will take on more than 3 million gal. of the alternative fuel blend in Washington state before joining the CSG on deployment. The advanced fuel blend was produced by California-based AltAir Fuels from a feedstock of beef tallow — waste beef fat — provided by Midwest farmers and ranchers and traditional petroleum provided by Tesoro. Pursuant to Navy requirements, the alternative fuel is drop-in, meaning it requires no changes to ship engines, transport or delivery equipment or operational procedures. The Defense Logistics Agency awarded a contract to AltAir Fuels for 77.6 million gal. of the alternative fuel blend, at a cost to DLA of $2.05/gal., making it cost competitive with traditional fuel. Through the Commodity Credit Corp., USDA is able to partner with the Navy to help diversify its fuel supply and simultaneously support America's farmers, ranchers and rural economies. Carrier Air Wing (CVW) 9, guided-missile cruiser USS Mobile Bay (CG 53) and guided-missile destroyers USS Stockdale, USS William P. Lawrence (DDG 110) and USS Chung-Hoon (DDG 93) are part of the JCS CSG. Sailing the Great Green Fleet in 2016 was one of the five energy goals Mabus set in 2009 for the Navy and Marine Corps. It was named to honor President Theodore Roosevelt's Great White Fleet, which helped usher in America as a global power on the world stage at the beginning of the 20th Century. The GGF will usher in the next era of Navy and Marine Corp energy innovation.